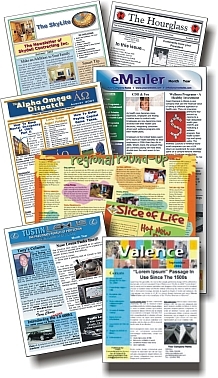 Online newsletters cost MUCH less and arrive quicker than printed. For as little as $200 per issue, we will prepare a professional, full color, custom newsletter to your complete satisfaction, perfect for electronic distribution and/or posting to your website! We will review your material for spelling and syntax errors to ensure that it is the very best that it can be. If you are a little short on content we will provide interesting and relevant material to complete the issue at no extra charge ! Eliminating costly print and USPS charges drastically reduces production and distribution costs. In fact, online distribution costs can be as little as 1.6¢ per piece! As the costly and time-consuming printing process is eliminated, distribution can proceed within minutes of your Final Approval of the layout. The whole process from approval to delivery takes much less time. Electronic delivery takes only minutes instead of a week or more when sending hard copy by USPS "snail mail". For a small extra charge, we will track and report on the delivery and disposition of your mailing allowing you to maximize the effectiveness of your campaign. Your hi-resolution, electronic Masters can be posted to your website, making them available to a worldwide audience. No trees need die for the production and distribution of electronic publications. Create a 2-page, 4-color, custom newsletter using your own text and graphic content. Provide a hi-resolution, electronic Master suitable for posting to your website. 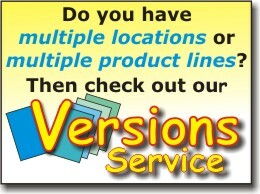 Distribute up to 500 copies to your eMailing list. *Monthly service price. A 4-pager is just $330. For more information on our SmallBiz Online Package, please CLICK HERE. Use one of our FREE Standard Designs and at no extra cost we will customize the colors to match your branding. Alternatively, for a mere $100 we will create a custom design that matches your vision, or recreate your submitted design. Many find the most difficult part of sending out newsletter on a regular basis is coming up with different, interesting content for each issue! For a nominal fee, our expert editorial team will do it for you to your complete satisfaction! Armed with your instructions and relevant key words and phrases we will do the research, then create interesting, relevant content that will capture and keep the attention of your readers. For more information on our Turnkey Content Service, please CLICK HERE. Apart from a one-time Setup Fee of $25.00, the cost of the basic service is decided by the number of eMails processed. Over 10,000? Please CLICK HERE to request a quote. Click HERE if you would like more information on our Online Newsletter services.